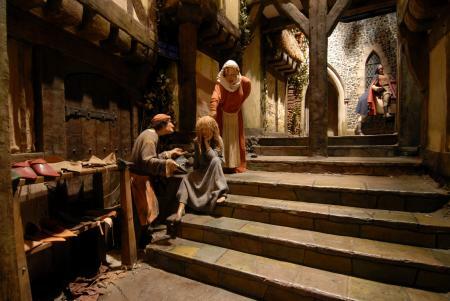 Take a trip back in time to the sights, sounds and smells of medieval Canterbury with a visit to the much-loved tourist attraction The Canterbury Tales. Go back in time to medieval England and join a group of pilgrims as they travel from The Tabard Inn in London to the shrine of St Thomas Becket in Canterbury Cathedral, telling stories to pass the time on the way. Elena Dalrymple visited The Canterbury Tales with Kate, 13, Tom, 11, and Emily, 7. A reconstruction of 14th century England inside the former St Margaret’s Church, The Canterbury Tales uses a blend of costumed guides and static scenes to bring five of Chaucer's tales of love, infidelity, intrigue, courtship and death to life. It's a theatrical, unusual introduction to Canterbury (and its renowned literary connection) and kids love it. The whole experience lasts around 35 minutes – disappointingly short as far as my children were concerned! – and is a great way to start a day exploring the modern city. A costumed guide offers a brief introduction to medieval life and religious pilgrimages before you join a story-telling contest in which some of Chaucer's most famous characters – the Miller, the Wife of Bath, the Pardoner, the Knight and the Squire – tell tales of ordinary people and lives in the 1300s. Some of Chaucer's work is notoriously bawdy, so kids get their own audio guide with age-appropriate content (though most of the suggestive comments on the adult tour are likely to go over their heads anyway!). The pre-tour dressing up in period costume will appeal to all young time-travellers (and a few older ones, too) − there's knights' armour, ladies' head dresses and more available to choose from. A kids'-only version of the audio tour means everyone's included in the stories, which have been specially adapted for little ears. That said, most kids will remember seeing an animatronic bottom appearing out of a window in The Miller's Tale for a very long time! 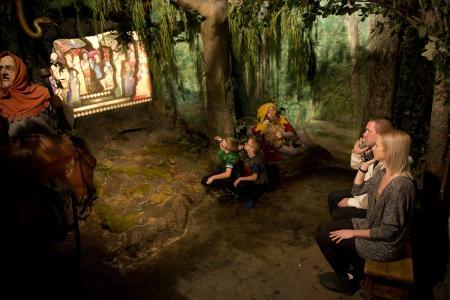 The atmospheric "streets" of London and Canterbury are great fun to look around, and the interactive story-telling elements are very effective even for children who are used to high tech entertainment! Waiting for our tour to start my children also enjoyed using the interactive screens in the entrance hall to find out more about Chaucer, "meet" the characters and see a map of the pilgrims' route from Southwark to Canterbury on the Roman road Watling Street, which runs from London through Rochester and Canterbury to Dover. School holiday events are included in the admission price; during the summer break there's a Medieval Story Garden where kids can learn to read the stars with Astrolabe Demonstrations, study Medieval Medicine to become a healer, take on the challenge of Knight School and be knighted by the Knight Master, and learn to Maypole Dance. There is no on-site cafe but the eating-establishment-rich streets of Canterbury are just a few steps away! The Canterbury Tales is in the heart of the city centre in St Margaret’s Street, just off the High Street. Admission: Adult £9.95, Child (5-17 Years) £7.95, Family (2 adults & 2 children or 1 adult and 3 children) £28.50. All visits are guided, so it's worth booking in advance to ensure you get a place in the timeslot you want. Whether you're looking for medieval figures, Pilgrims' Badges or dressing-up armour, there's plenty to choose from in the gift shop. If a visit to The Canterbury Tales has inspired an interest in Chaucer's stories, Marcia Williams' comic-book version, Chaucer's Canterbury Tales, is highly recommended. Download a brilliant KS2 resource pack about the Canterbury Tales, Chaucer and medieval life and ideas for further reading from the website; sketches of each of the pilgrims are also available if your child wants to draw a record of their visit. They also cover story-telling techniques and traditional tale genres including fables, myths and fairy tales.